If you have read the articles in Pixelsdimension right from the start, you would’ve noticed that the Raynox-250 had been mentioned quite a number of times, particularly in Getting Your First Macro Camera. This Raynox-250 is essentially a Macro Conversion Lens (MCL) which, when clipped on, drastically increase the magnification of your lens (2.5x to be precise). There are many benefits to using a MCL, and the Raynox-250 is by far the most popular in Malaysia- People will always recommend this model, and most would just follow the advice. Like many others I started off with a Raynox-250. 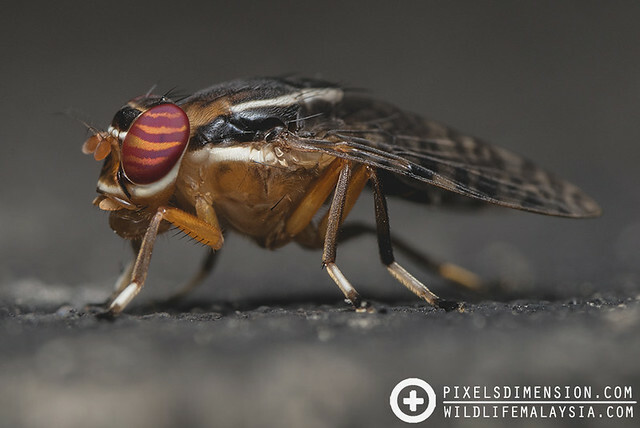 This Signal Fly was taken with a Raynox Macro Conversion Lens, a versatile macro accessory that is often present in a Macro Enthusiast’s arsenal. It is not until my recent discussion with a famous Macro Photographer that I noticed that there are other suitable and practical MCL for Macrography, notably the Raynox-150. The Raynox-150, as you might have guessed, is the little brother of the Raynox-250, providing slightly less magnification (at 1.5x) but with a slightly farther working distance. This particular article aims to enlighten beginners or enthusiasts about the performances of Raynox-150 and Raynox-250, allowing them to select the MCL more suited to their style of photography. Brothers. The very popular Raynox-250, and its neglected brother, the Raynox-150. Which one do you need? After learning a bit more about the Raynox-150, I have decided to buy one and try it since it suits my way of taking natural, wildlife photos. 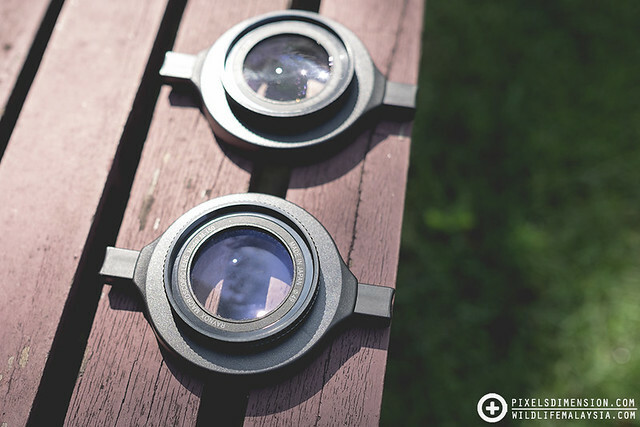 A brief surf of the internet quickly revealed that there was pretty much only one store selling this particular lens, and at a hefty price too! So if you are keen on purchasing this MCL after reading this article, you might want to consider importing one from overseas, which will likely be cheaper. The prices of the Raynox-150 and Raynox-250 are quite close at ~RM250-300. In terms of specifications, both the Raynox-150 and -250 have a front mount diameter of 49mm, and a rear mount diameter of 43mm (and comes with a clip-on universal mount suitable for lenses with diameter of 52-67mm). The Raynox-150 (1.5x magnification) is only very slightly lighter than the Raynox-250 (2.5x magnification). The following are some sample shots using a Raynox-150/250 on a Nikkor 105mm F2.8 lens mounted on a Nikon D800 for comparison. Shots were taken at a fixed settings of ISO100, F16, 1/250, 105mm, flash fired at full power (with diffuser). All photos are unedited and not cropped; the maximum and minimum distances of each MCL were also roughly measured. However, due to slow internet and limited quota, I am uploading the resized versions. For those who are interested in the original files, please feel free to email me at jtan@utar.edu.my. 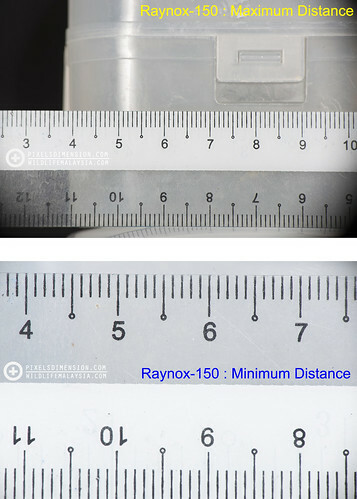 Unedited photo showing [Top] the maximum possible distance (minimum magnification) and [Bottom] the minimum possible distance (maximum magnification) of the Raynox-150. 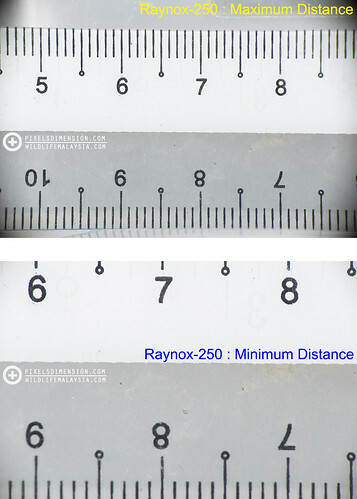 Unedited photo showing [Top] the maximum possible distance (minimum magnification) and [Bottom] the minimum possible distance (maximum magnification) of the Raynox-250. The maximum focusing distance (minimum magnification) is 22cm; the minimum focusing distance (maximum magnification) is 12.5cm. The maximum focusing distance (minimum magnification) is 13cm; the minimum focusing distance (maximum magnification) is 8cm. * Please take note that these measurements were obtained on a 105mm macro lens, and a Full-frame (FF) Nikon D800. On a Crop-Sensor (APS-C) DSLR with the same lens, the distance will be slightly farther. Learn more about the difference between Crop-Sensor and FF DSLRs in Choosing the Best DSLR for Macro Photography. Of course, all these numbers do not mean much when out in the field, it all depends on what you are shooting. If you are photographing a very tiny subject, say <1cm, the Raynox-250 will really come in handy as it offers enough magnification for a great shot. However, if you are photographing subjects that are larger than 1cm (which many insects are), the Raynox-250 would not be able to fit the entire subject into the frame since you can only “zoom out” that much (~13cm). Even if you manage to “squeeze” the entire subject (say <2cm) into the shot, due to the shallow Depth-of-Field (DOF) [Learn more about DOF HERE], your shot will not turn out well either, especially if you are shooting at poor angles. The Raynox-150, on the other hand allows you more versatility when it comes to photographing larger insects (due to the large focusing range of 12.5-22cm), although it doesn’t offer as much magnification as its counterpart; sometimes it can be a good thing. Taking a single shot at the highest magnification possible will not always give you the best results, particularly so if your subject is large in size. This shot was taken with a Raynox-250. I took this shot focusing on the eyes of the bug. 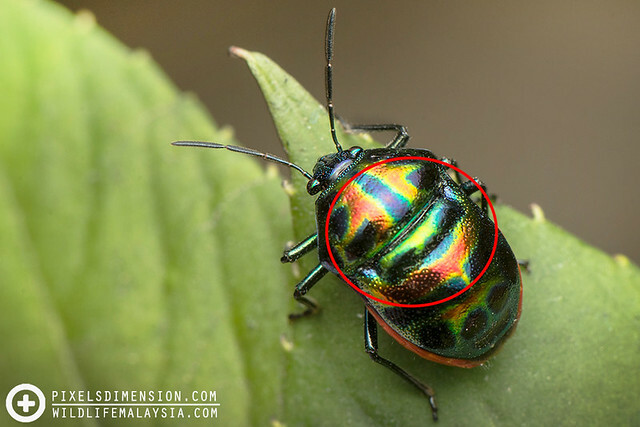 Even though I wasn’t shooting at highest magnification, you can easily see that part of the bug (red circle) is already out of focus (OOF). So if you were to get closer, the OOF parts will become more apparent, even to the point that it ruins your shot. Most beginners in Macro Photography will always opt for Macro Systems with the highest magnifications (I use to do this as well XD), which is why Raynox-250 is so popular. However, in many cases the Raynox-250 is often shelved because of its limited usability i.e. close focusing distance and shallow DOF. This is when the Raynox-150 might perform better, depending on the shooting style of the Macro Enthusiast. Getting the Macro Conversion Lens that offers the highest magnification could turn out to be a double-edge sword. It is best to understand your style of shooting before making the pick. It is not really difficult to determine whether the Raynox-150 or -250 suits you better. Just have a look at your previous Macro photos. Do you usually photograph large or tiny organisms? For the former, go for the Raynox-150, and for the latter, the Raynox-250. Simple as that. 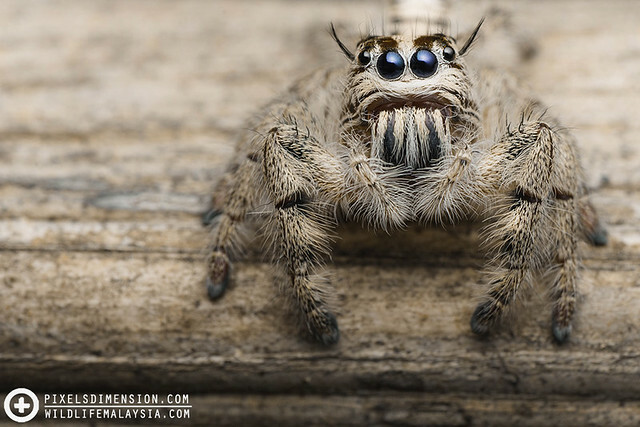 A Hyllus diardi heavy jumper. If you love to shoot tiny subjects of ~1cm or less, then the Raynox-250 would certainly suit you better. However, you are going to have to learn to cope with the limited working distance, which can be challenging to focus on a moving subject. 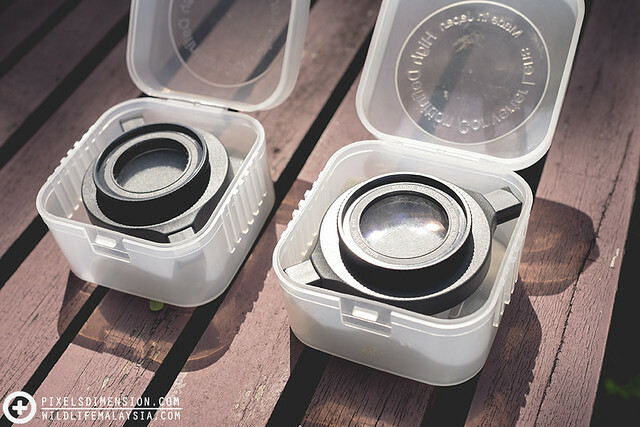 I hope you find this short article useful, especially to those who are looking to try out Raynox MCL lenses. 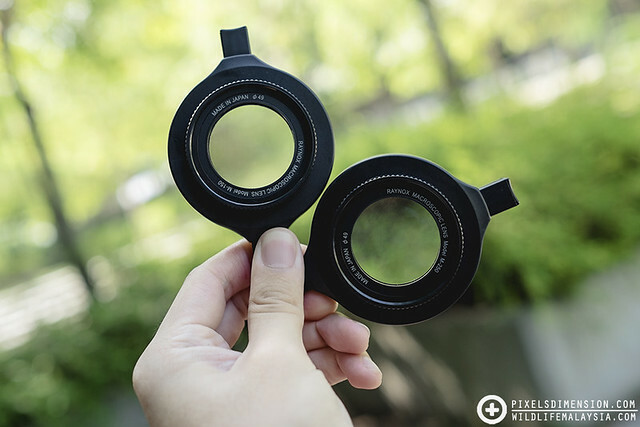 For those who are currently using Extension Tubes and are wondering why you should upgrade to MCL lenses, please read Long Term Review: Extension Tubes vs. Macro Conversion Lens. Until then, thank you and have a pleasant day ahead guys!